An amazing development opportunity in the "Bird Streets" of Los Angeles. Designed by Arxis Design Studio. This concrete, glass, and steel home represents the future of Modern luxury in Los Angeles. All public rooms boast head-on city and ocean views. Sumptuous maser suite with huge closets and balconies. There are 4 additional bedroom suites and attached guest house as well as housekeepers quarters. Sleek gourmet kitchen that opens to large family room. Dining room, movie theatre, gym, massage room, library and more. RTI - Shovel Ready! Panoramic city to ocean acre view lot. The most exciting opportunity in the famed Bird Streets of The Sunset Strip. Exquisitely designed plans by Arxis Design Studio. This warm contemporary home represents the future of Modern luxury in Los Angeles. All public rooms are sited to take advantage of the stunning views. Seven bedrooms, including one of the most sumptuous master suites with huge closets and balcony. Sleek gourmet kitchen that opens onto a large family room. Dining room, movie theatre, gym, massage room, library and attached guest house. Luxury finishes throughout such as ledger stone walls and wood ceilings. Fleetwood sliders retract to create a seamless indoor/outdoor experience. The home is approximately 15,040 square feet with an unprecedented 15,000 square feet of outdoor entertaining space. The property features 2 gorgeous pools and 3 spas with an infinity mote that wraps the length of the house and stretches 200 feet in length. The relaxing pool with spa is juxtaposed against the swimmers lap pool that is connected by a waterfall. The 3rd spa is found in a grotto adjacent to the massage room. Fantastic state of the art outdoor kitchen, conversation fire pit area and grassy lawn. Gated, down a log private drive with a 3-car garage and additional parking. 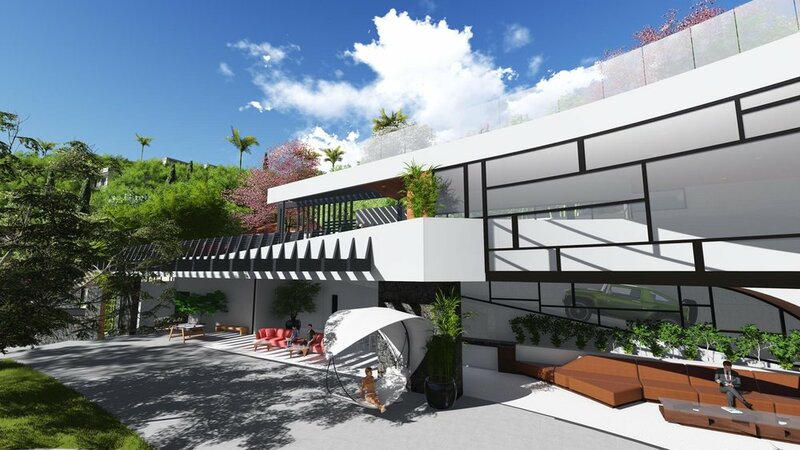 A masterpiece that will usher in a new era of luxury living in Los Angeles! Price includes plans and ready permits.